The end of the cult of catastrophic anthropocentric global warming is in sight. Showtime’s producers undoubtedly have the best of intentions. There are serious long-term risks associated with rising greenhouse gas emissions, ranging from ocean acidification to sea-level rise to decreasing agricultural output. 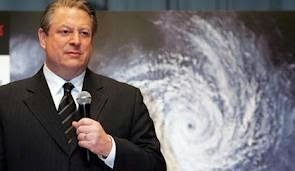 For instance, Al Gore’s 2006 documentary, “An Inconvenient Truth,” popularized the idea that today’s natural disasters are increasing in severity and frequency because of human-caused global warming. It also contributed to public backlash and division. Since 2006, the number of Americans telling Gallup that the media was exaggerating global warming grew to 42 percent today from about 34 percent. Meanwhile, the gap between Democrats and Republicans on whether global warming is caused by humans rose to 42 percent last year from 26 percent in 2006, according to the Pew Research Center. Other factors contributed. Some conservatives and fossil-fuel interests questioned the link between carbon emissions and global warming. And beginning in 2007, as the country was falling into recession, public support for environmental protection declined. Everything else must find room in the unexplained 10%.